Vayalar is the perfect, yet to be discovered, gateway to the backwaters of Kerala. A small village, a few kilometers from Cherthala, it is nestled cozily between Lake Vembanad and the Vayalar Kayal, part of the famed backwaters of Kerala. The Saravor group of companies, has started a resort and spa, the Vasundhara Sarovar Premiere, and this was our base for our 4 day exploration of the backwaters and coast of Kerala. Water edged living, Caress of luxury, living culture, a southern sojourn is how it is advertised, and it just might all be true. We stayed in a heritage villa, a 200 year old prince’s palace, kovilakam, replanted on the banks of Vembanad Lake. Attangudi tiles adorn the floors, the 4 bedrooms opened up to an inner courtyard, an open patio offering unhindered views to the lake, and customer service that served every need made our stay, truly incredible. The traditional ayurvedic massage, including a calming shirodhara, transported our mind, body and soul to God’s own country. The resort also has deluxe rooms, suites, floating cottages and a houseboat if the stay in a heritage villa is not your thing. There is an infinity pool, a game room, a temple, and 3 restaurants in the property. They also offer excursions around the backwaters, evening events, and lots of aqua activities. A family resort. Spend your days, boating on Vembanad lake and the backwaters, or relax within the resort on their artificial lake, catch a toddy tapper collecting fresh toddy, learn to fish, or just lounge in the infinity pool and jacuzzi. Spend your evenings, with a book, on a hammock, get some dinner at the restaurant and retire to your villa and sleep outside in the thinnai (patio). The next day, awaken to the call of the birds that swarm the property and start all over again. Cochin, is a major port city on the west coast of India by the Arabian Sea and is part of the district of Ernakulam in the state of Kerala. Fort Kochi is part of an island toward the south-west of the mainland Kochi, and includes the Mattancherry area. Enter Fort Kochi via ferry from the mainland or over the bridges from Willingdon Island. Fort Kochi is the tourist nerve-center of Kerala. It is one of the most visited cities in India and its history over the last 1000 years has shaped its people, its culture and its soul. Vasco Da Gama square has the most prominent hotels, but we chose to stay in the only hotel on the beach, the Old Lighthouse Bristow Hotel. Harbour engineer Robert Bristow was brought to Kochi in 1920 under the direction of Lord Willingdon, then the Governor of Madras. In a span of 21 years, he transformed Kochi to one of the safest harbours in the peninsula. His house built in 1927 was converted to the present day Bristow hotel. Fort Kochi is best explored on foot. We checked-in, and refreshed ourselves with authentic Kerala fare, Kerala paratha, eggs added to give it fluffiness, with a side of avial, vegetables cooked in coconut, sweet dessert of banana fry with coconut slices and cardamom tea to wash it all down. We then started our walk along the beach, past the old gun ruins of the fort to Vasco Da Gama square, where the Chinese fishing nets gave us the first glimpse of the old Cochin. It was earlier thought that the nets might have been introduced by the Chinese explorer Zheng He though recent research shows that they were introduced by Portuguese Casado settlers from Macau. 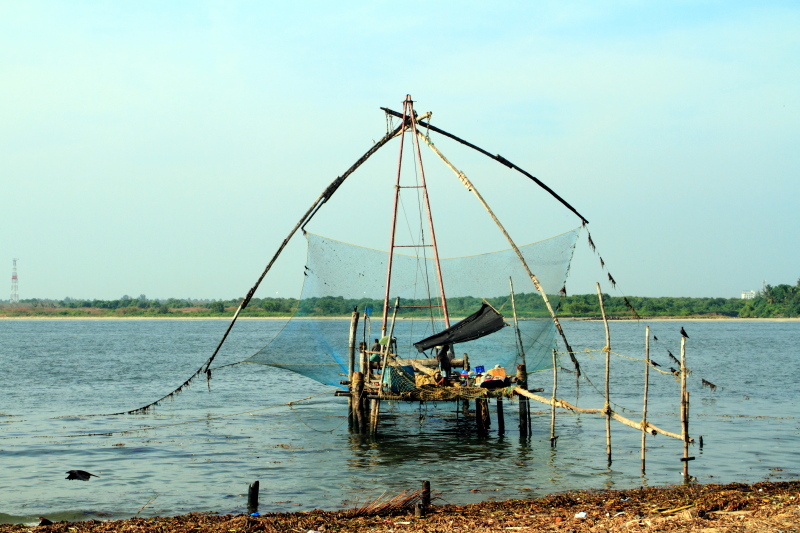 The slow, rhythmic rise and fall of the nets, catching fish at every dip is a perfect metaphor for life in Cochin. Slow, relaxed, purposeful, beautiful. Around Vasco Da Gama square are various traders, selling the daily catch, trinkets and souvenirs and anything else a tourist might want. Walk through town to St. Francis CSI Church, built in 1503, the oldest European church in India and once home to the remains of Portuguese explorer Vasco da Gama who died in Kochi in 1524 when he was on his third visit to India. His body was moved 14 years later to Lisbon. Another must see church is the Santa Cruz Basilica. It was built by the Portuguese and elevated to a Cathedral by Pope Paul IV in 1558, was spared by the Dutch conquerors who destroyed many Catholic buildings but later demolished by the British. Bishop D. João Gomes Ferreira commissioned a new building in 1887. Consecrated in 1905, Santa Cruz was proclaimed a Basilica by the Blessed Pope John Paul II in 1984. The interiors are adorned with paintings of the Jesus’ crucifixion and needs more than a few minutes to appreciate. We stopped over at the tourist hyped Kashi Art Cafe on Burgher street and then proceeded by auto to Mattancherry. The Mattancherry palace was built by the Portuguese and presented to Veera Kerala Varma (1537–65), Raja of Kochi, in 1555 AD. The Dutch carried out some extensions and renovations in the palace in 1663, and Hyder Ali and the British East India Company all made renovations. Today it houses some of the most exquisite hindu temple mural art. The Paradesi Synagogue built in 1568 by the Malabar Yehudan people, is the oldest active synagogue in the Commonwealth of Nations. It shares a wall with the Pazhayannur Bhagavathy Temple and the palace and symbolizes another aspect of Cochin, the coming together of secular beliefs. On the road to the synagogue are antique shops of Jew Town, most of whose inhabitants have since migrated to Israel and have now become home to Kashmiri traders. The Kochi-Muziris Biennale 2012, an international exhibition of contemporary art was in progress and was set in spaces across Kochi, Muziris and surrounding islands. There are shows in existing galleries and halls, and site-specific installations in public spaces, heritage buildings and disused structures. We kept our eyes open for the many exhibits around Fort Kochi. The geographic beauty of an island, the stress-free pace of life, the confluence of cultures east and west and the sumptuous food makes Fort Kochi a perfect place to start your explorations into God’s own country. Alappuzha (Alleppey), Lord Curzon, once claimed, was the Venice of the East. A two hour drive south from Cochin, this town, the sixth largest in Kerala, is strategically located between the Arabian Sea and the backwaters of Kerala and the Vembanad lake. The abundance of water bodies continues through the district as canals and rivers empty into the lake and the sea. Alappuzha hosts the annual Nehru Trophy Boat Race, held on the Punnamada Lake on the second Saturday of August every year. The popular Alleppey beach was our first stop, a long stretch of sand and coconut trees. The beach is very clean, with facilities for restrooms and food options available. For a truly unreal experience, take a camel ride on the beaches of Kerala. Alappuzha is also a every-day working town, unhyped by tourists and thus offers great bargains for shopping. No trip to Kerala is complete without a purchase of spices and the Alappuzha market is filled with them. The scent of cardamom, cinnamon, cloves and other exotic spices fill the air and it is definitely worth buying a few grams of it all. The market area also has brick and mortar shops where one can purchase the traditional Kerala set-saree. The golden borders and mango designs on the white sari is a great look. 10 Kilometers north of Alappuzha is Mararikulam, a beach village. It is one of the best kept secrets of Kerala but not for long. This sleepy little village is an idyllic location for a vacation with very few resorts, so you can experience God’s own country without the hustle and bustle. Marari beach (Mararikulam beach) is one the best beaches we’ve ever seen, anywhere in the world. White sand leading up to the water, is bounded by lush coconut trees and a winding lake that snakes inwards from the beach. The coconut trees offer plenty of shade and perfect harness spots for hammocks. If you are stressed out, pack your bags, go to Marari beach, drink some coconut water and relax. The Indian equivalent of a Corona on a Cabo beach. Your next stop is another 10 kilometers north of Mararikulam. Another sleepy town, Arthunkal, is one of the most important pilgrimage sites in Kerala. It is considered as a holy land by hundreds of thousands of devotees, of Christian as well as other faith. It is home to one of the most famous churches in Kerala, the Arthunkal St. Andrew’s Forane Church, originally built by Portuguese missionaries in the 16th century. The church was rebuilt in 1584, under the then vicar Fr. Jacoma Fenicio, whom the devotees claim, possessed magical powers to heal the body and mind. Devotees fondly referred to him as Arthunkal Veluthachan, which in English translates to fair skinned father. Fr. Fenicio died in 1632. Eight years after his death, the church was rebuilt again, this time facing the west towards the long white-sand beach on the shores of the Arabian Sea. In 1647, the idol of St. Sebastian, struck with arrows all over his bleeding body (he was executed at the order of the Roman emperor for embracing Christian faith) sculptured in Milan, was brought and placed in the Arthunkal church. The church was granted basilica status in 2010 and now sees a constant stream of visitors and worshipers. We finished our half-day excursion with a typical Kerala meals, rice with a selection of curries, dals, pickles and sweets, at the Travancore Palace hotel in Cherthala. Built like an heritage Kerala property, the decor is very inviting. The food was good too. Unfortunately, the service was really slow, almost uncaring, and thus a real let-down. The hotel has a wonderful garden and is perfect for that afternoon post-meal relaxation but the customer care really needs to improve. The Alleppey district, is only a few hours from Cochin, and with its own charm, has a lot to offer on its own. Plan to spend a day and definitely use Mararikulam as your base. Kumarakom, the most famous backwaters village in Kerala, is on the east banks of Vembanad Lake which is the largest freshwater lake in the state of Kerala and the longest lake in India. Arundhati Roy’s The God of Small Things is set in Ayemenem or Aymanam village, which adjoins Kumarakom. The explosive success of this novel has given some added tourism impetus to this area. To satisfy the thirst for tourism, many resorts have sprung up, doting the banks of the backwaters and the lake. Coconut lagoon, has probably the most prime spot, opening up into the lake and daily visits from all the birds. KTDC has a resort, Waterscapes, which also serves as the entrance point into the Kumarakom bird sanctuary. Kumarakom Bird Sanctuary serves as a temporary home to many species of migratory birds. The Vembanad Lake is a habitat for many marine and freshwater fish species and it teems with Karimeen and shrimp. The bird sanctuary extends over 14 acres and came into existence following preservation efforts from the government. Egrets, Herons, Kingfishers, Cormorants all are found in plenty. Any picture you see of the backwaters of Kerala was probably taken in Kumarakom, and no amount of pictures evokes the same feelings as gliding in a kettuvallam, a traditional boat, or a houseboat on the backwaters or on Vembanad lake, and being part of an ecosystem that includes thousands of birds. Kumarakom and the backwaters of Kerala are a must see for any visitor to India and truly represents the words Incredible India.